Eduardo Arzt is currently Director of Biomedicine Research Institute-CONICET-Max Planck, Professor at the University of Buenos Aires, Visiting Professor at the Max Planck Institute in Munich, Germany, External Scientific Member of the Max Planck Society and Director of the BioMedicine Institute of Buenos Aires- CONICET- Partner Institute Max Planck Society. 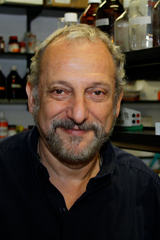 His work has been awarded in multiple occasions with, among others, the Guggenheim Fellowship by the John Simon Guggenheim Memorial Foundation, New York, USA; the Bunge and Born Foundation Award for Outstanding Researcher in Experimental Medicine, the Berthold Medaille from the German Endocrine Society and TWAS Prize in Medicine. He has published his work (more than 160) in a variety of journals and has participated as invited speaker in more than a hundred and fifty conferences. He is known not only for his findings, which are an example of research in biomedicine, transferring results from basic molecular biology to pharmacological applications, but also for his vast institutional achievements for Argentine and Latin-American science, including an active and important role in the development and realization of the project of the Polo Científico Tecnológico and the creation of the Biomedicine Research Institute of Buenos Aires – CONICET – Partner Institute of the Max Planck Society.